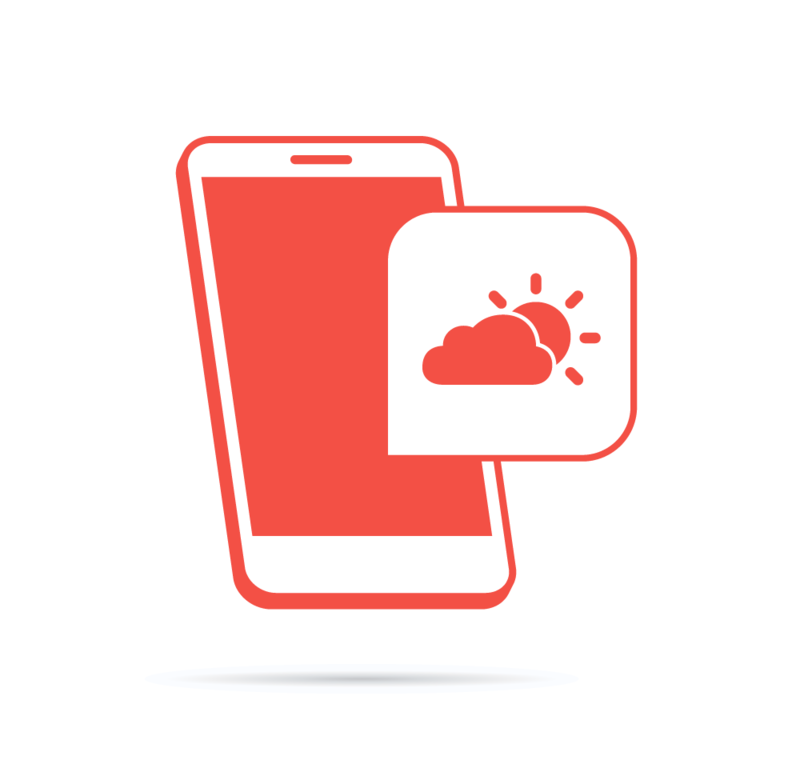 In this article, we will modify our Laravel-powered phone-capable weather forecast app so that it is accessible via SMS (text message) in addition to the voice telephone system. It is recommended you read the previous post if you haven’t done so yet – it’s a 10 minute read for an excellent outcome. Note: If you’re confused by the development environment we’re using, it’s Homestead Improved and you can learn more about it here, or go in detail by buying our book about PHP environments. The prefix for the route is sms, so that routes will have a path like /sms/weather, as the one in the example. This is the only route we need for SMS, as Twilio will call the same route over and over again. Twilio will access it via HTTP POST. We could also do this without the prefix, but it’s more flexible this way if we decide to add more functionality to the SMS side later. This function is very similar to the old one. The only difference is that it takes into consideration that the weather request might be coming form a telephone device via SMS, so it makes sure that the weather forecast isn’t too long and tries to limit it to less than 140 characters. The response for SMS is still TwiML, just formatted for SMS. When an SMS message comes in from a user, Twilio will always hit the same route. This app does not have any redirects. That is why we only defined one route meaning all the requests will be going through the showWeather method. There are different things a user can text the app, so we will parse the request body to figure out what they want using the parseBody method. The parseBody method first creates a default return value. Then, it strips whitespace. This is so that if a user inputs “90210 ” (note the space), the program will still work as intended. Once the whitespace has been stripped, the body of the text is evaluated against three if statements. The first if statement checks to see if the user entered a zipcode. The second if statement checks to see if the user entered in a day of the week. It normalizes the input by making sure that only the first letter is capitalized, and compares it to the contents of the $daysOfWeek array property in the WeatherService class to determine if a day of the week was mentioned. The last if statement checks if a user requested the credits. If none of the three if statements evaluate to true then the program cannot figure out what the user wants and will return the default value. 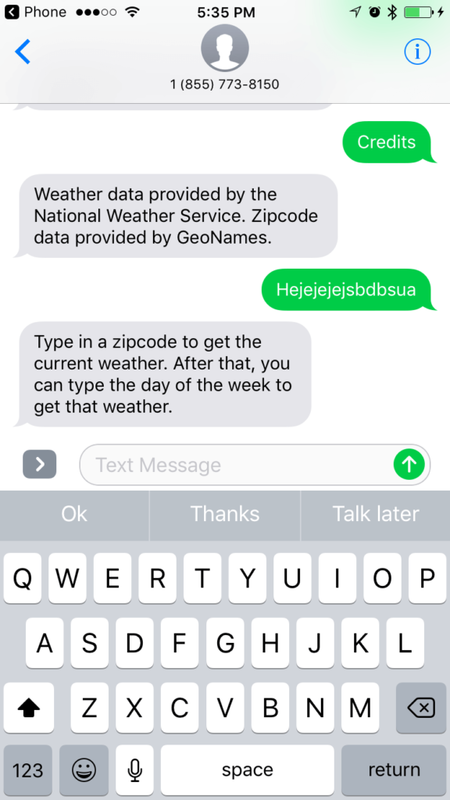 This default value will make the weather method send the user a help message that explains how to use the app. The parseBody method returns an array with two keys in it. The command key is what the user’s intention was determined to be. The data key is the data that goes with the command. Inside the showWeather method, after the parsebody is called, a switch statement is used to look at the value of the command array key. <Message>This Afternoon the 31st: Sunny, with a high near 72. South southwest wind around 8 mph. <Message>Monday the 3rd: Sunny, with a high near 70. <Message>Weather data provided by the National Weather Service. Zipcode data provided by GeoNames. <Message>Type in a zipcode to get the current weather. After that, you can type the day of the week to get that weather. Login to your Twilio account and navigate to the settings for your phone number. You can see your number by going to this page. In the SMS section, put in the URL in the following format: http://NGROK_HOST/sms/weather, where NGROK_HOST is the hostname in the URL you noted from the Ngrok program. 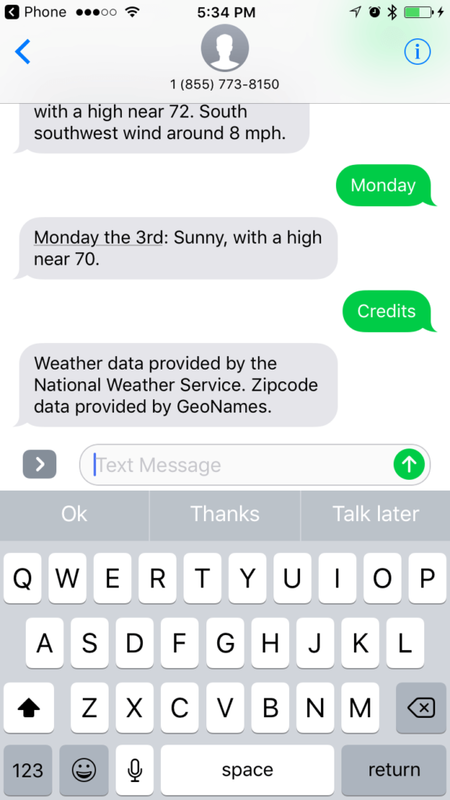 Open up the text messaging app on your phone and send a zipcode like 92010 to your Twilio phone number. In a couple of seconds, you should get a response with today’s forecast. 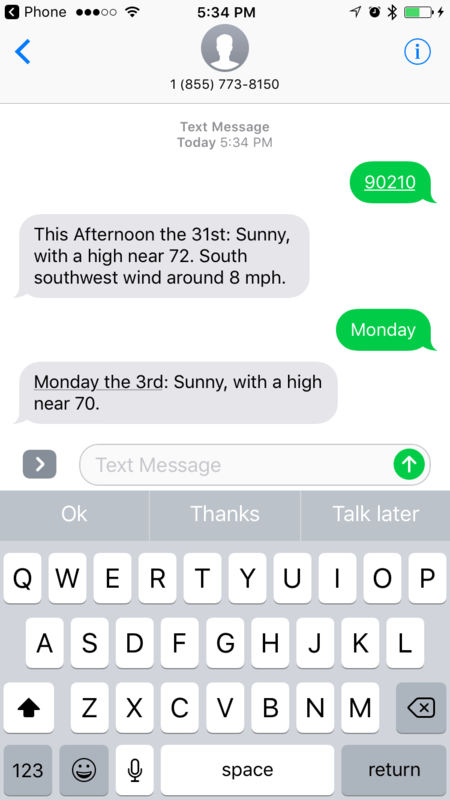 Next, you can send a day of the week to the number and it will respond with that day’s forecast. You can also send the word credits and it will return the credits. 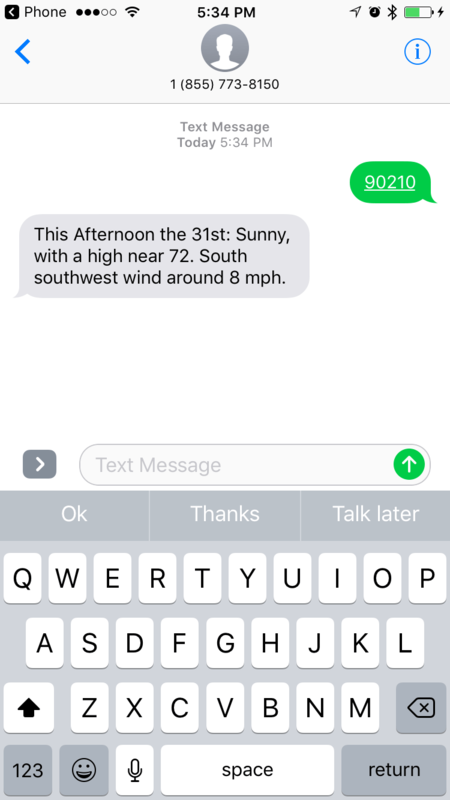 If you enter in a command the weather app does not understand, it returns some help text. Over the course of two articles, we have seen how to build an application that is able to interact with users via the voice telephone system using voice menus and to interact with them using SMS. This was implemented using Laravel for the application backend and Twilio for the telephone / SMS integration. 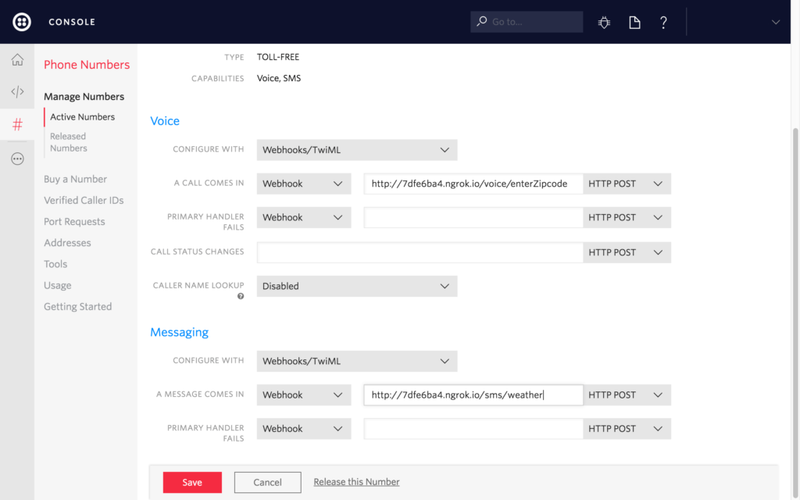 With writing a little bit more code, we have seen that it is possible to extend the voice app to have the same functionality exposed to users via SMS. You can find the example code for this article series on Github. There are lots of possibilities for apps that you can implement with Twilio and PHP, this is just a little glimpse into what can be done. Check out the documentation here for some inspiration.